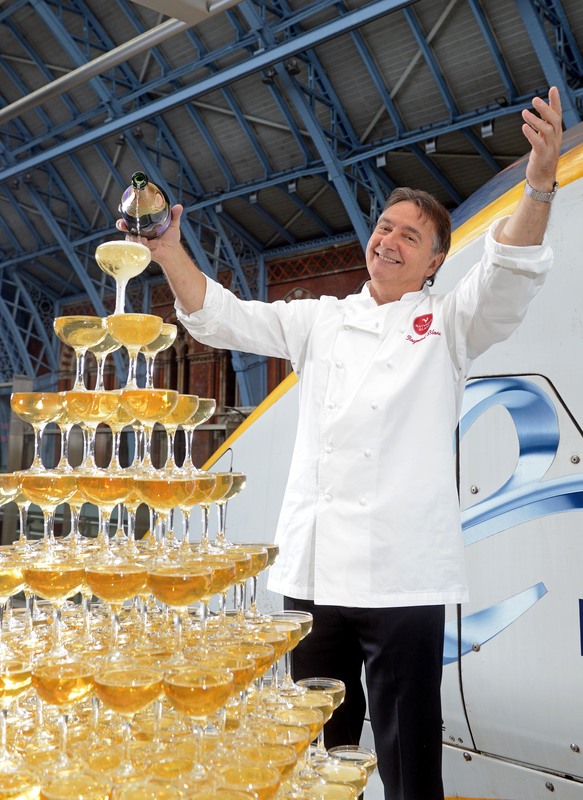 Eurostar, the high-speed passenger rail service linking the UK with mainland Europe, kick-started their 20th anniversary celebrations by setting the GUINNESS WORLD RECORDS title for the Largest Champagne Tasting Event earlier today. 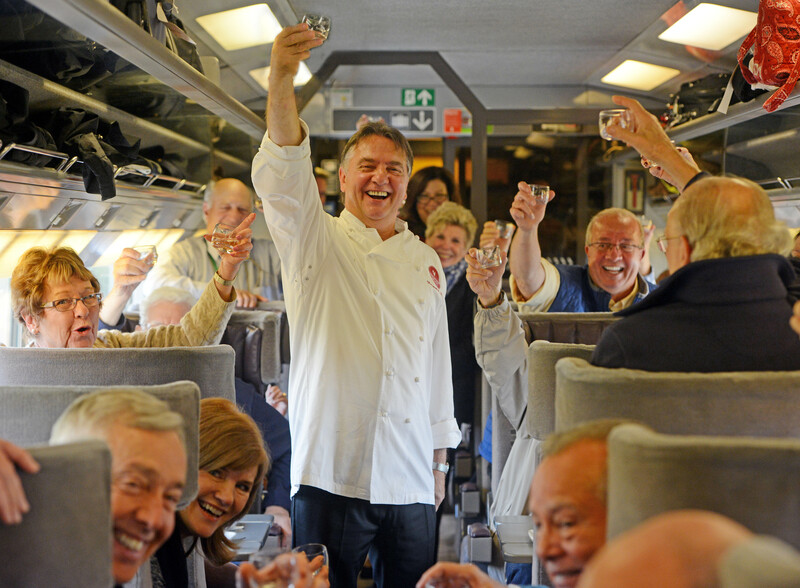 Passengers on the 10:25 service from London St Pancras were welcomed on board with a special announcement from Eurostar’s Business Premier Culinary Director and Michelin starred chef Raymond Blanc who hosted the tasting alongside his very own sommelier from Belmond Le Manoir aux Quat’Saisons, Arnaud Goubet. Travellers in all classes were served three types of Champagne to sip one by one guided by leading wine expert and sommelier Arnaud Goubet. 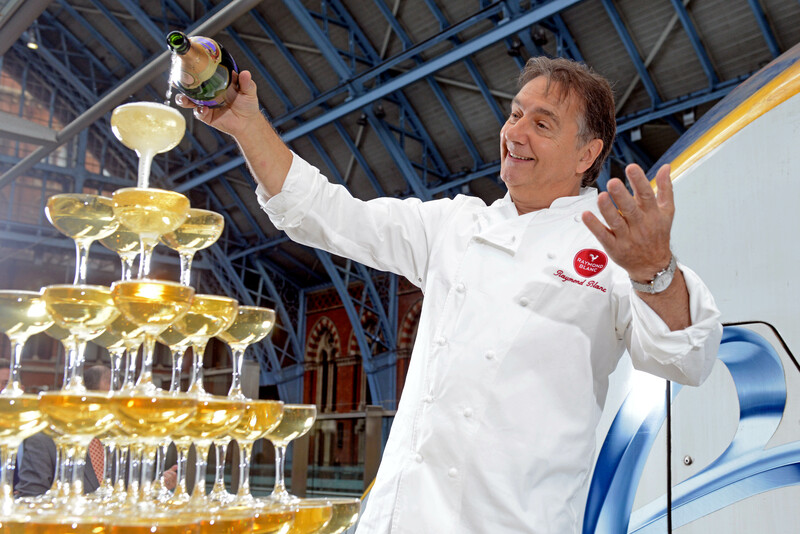 Passengers were also given a slice of Opera cake selected by Raymond Blanc to complement the Champagne. 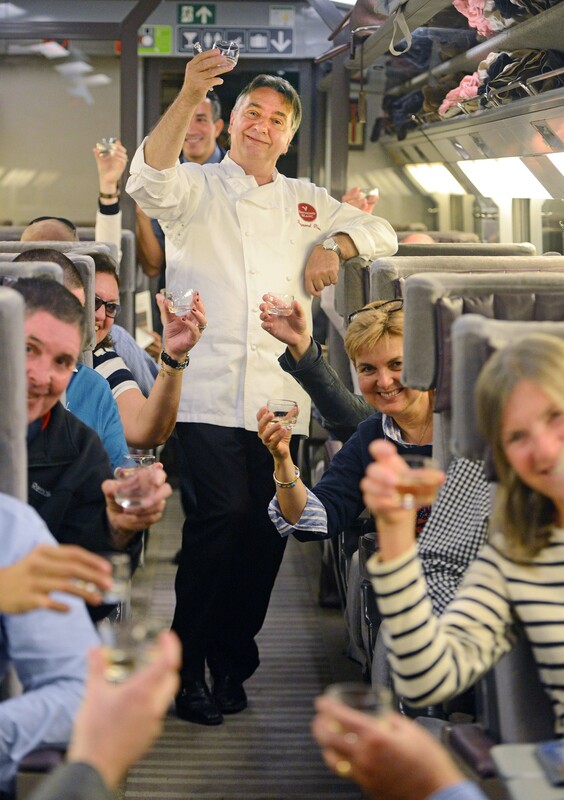 Shortly after the tasting finished on UK tracks, the official GUINNESS WORLD RECORDS adjudicator raised her glass to announce to passengers that a new record title had been set for the Largest Champagne Tasting Event, with 515 taking part. 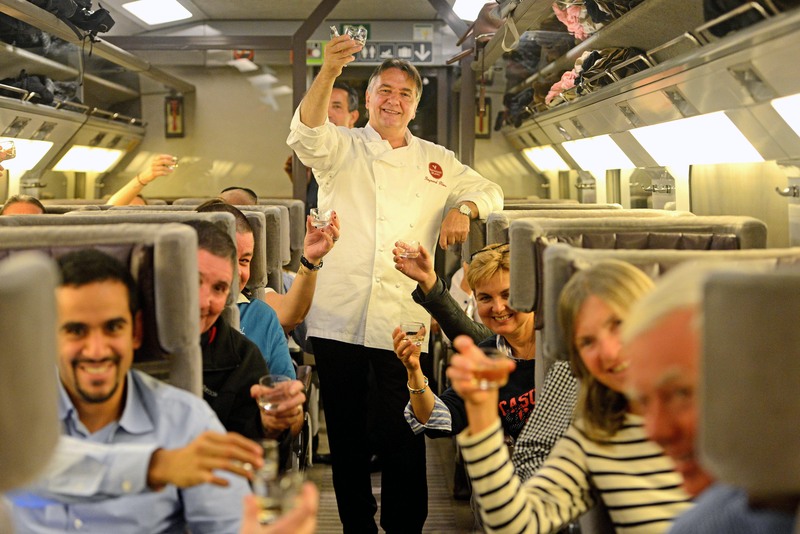 The tasting also marks two years since Eurostar and Raymond Blanc joined forces to transform the on board dining experience for Business Premier passengers. Renowned for his passion and innovative culinary expertise, Raymond works with each of Eurostar’s three kitchens to create seasonal menus combining the best of British and French cuisine and featuring sustainable ingredients of local provenance. 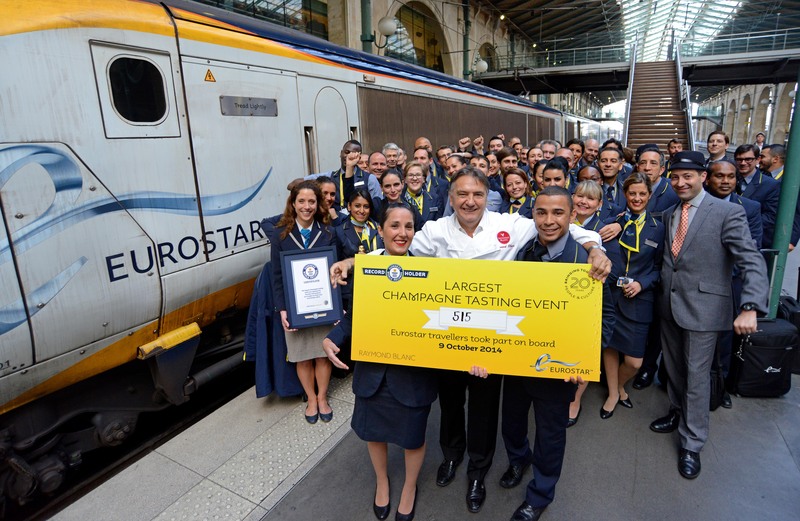 Marc Noaro, Service and People Director, Eurostar, said: “Today marked the start of our 20th anniversary celebrations and we’re delighted to have shared this special occasion with our passengers who joined in the festivities and set a new GUINNESS WORLD RECORDS title. Eurostar passengers can look forward to a series of events and promotions in Eurostar stations over the coming weeks to help celebrate 20 years of Eurostar. 3. The current Eurostar train was first introduced into service in 1994 carrying 750 passengers and operating at speeds of up to 300kph. Since then, the fleet of 28 trains has carried more than 130 million passengers between London and the Continent. Following their refurbishment these trains will continue to form a core part of the Eurostar fleet. The new e320 will carry around 900 passengers at speeds of up to 320kph.